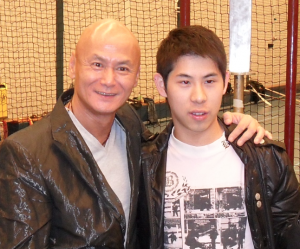 Hong Kong 25 June 2013 – This morning Hong Kong director Lau Kar Leung sifu passed away at age 76. He is a legendary Martial Artist who influenced the whole film industry in Martial Arts films, where his nickname ‘Kungfu Leung’ came from. He had been battling lymphatic cancer for two decades. Lau was the third child of Lau Cham (Lau Jaam, 劉湛), a martial arts master who studied Hung Gar under Lam Sai-wing, a student of Wong Fei-hung. Lau, a fourth-generation direct disciple of martial arts legend Wong Fei-Hung and a lifelong practitioner of the Hung Kuen discipline, was most famous for his directorial efforts The 36th Chamber of Shaolin (1978), starring Kill Bill’s Gordon Liu (Left picture), and Drunken Master II with Jackie Chan, which also won him the Best Action Choreography Award at the Hong Kong Film Awards in 1994. He has a brother who makes a living in the film industry, actor/choreographer Lau Kar-wing, as does Gordon Liu, Lau’s pupil and godson to Lau’s father, Lau Cham. 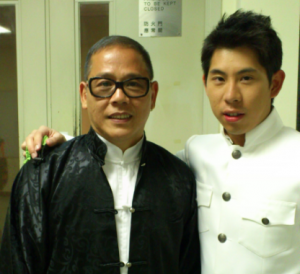 His nephew Lau Kar-yung (son of his older sister) is also an actor, choreographer and director as seen on the picture right. When he speaks, I can see that they have the same way of talking, the intonation is so similar. Lau’s directing work was characterized by a strict adherence to the principles of martial arts. He continued his work as action choreographer and director until 1994, when he made Drunken Master IIand III and was diagnosed with lymphoma. He survived the disease and made a directorial comeback in 2003 with Drunken Monkey, which he starred in along with his martial arts protégé Liu. In 2007, at the age of 70, he served as action choreographer and in a supporting role in Tsui Hark’s Seven Swords. Lau was awarded the Lifetime Achievement Award at the Hong Kong Film Awards in 2010 for his contribution to the martial arts film genre.